Shortly before flying to Washington to attend the G-20 meet, Prime Minister Manmohan Singh today expressed concern over the likely slowdown in the growth of developing countries due to the meltdown and called for strengthening global financial institutions, like the IMF and the World Bank, to avert such crisis. The inflation slowed to a five-month low, giving RBI further room to cut interest rates in an effort to help protect the economy from a global slowdown. The wholesale price index rose 8.98 per cent in the 12 months in the week ending November 1, sharply below the previous week's annual rise of 10.72 per cent and the predicted median forecast of 10.28 per cent. Will the Obama presidency be good for India? Even as the BJP released its second list of 43 candidates for the Rajasthan Assembly elections, it received a serious jolt when its sitting MP from Bharatpur Vishwendra Singh announced his resignation from the party and Lok Sabha and declaring his intent to contest the Deegh-Kumher assembly seat. Having sacked former Congress general secretary Margaret Alva for charging the Congress with selling party ticket, the Congress today turned around and sacked its senior Dalit leader Yogendra Makwana for supporting Alva’s charge. Another Singur for Tatas in Bastar district? 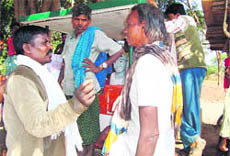 A Singur-like situation is brewing in the tribal heartland of Bastar. In the picturesque Chitrakoot Assembly constituency in central Bastar are 11 villages where resentment against a proposed steel plant by industrial giant Tata Steel is growing. Canvassing and discussions on at Baranji village in Chitrakoot Assembly segment in central Bastar. HIMACHAL: Vocational trainers on ‘vacation’ ? Riding the wheels of development, the ruling Congress will use the ‘Vikas Rath’ to take on the opposition Bharatiya Janata Party’s (BJP) comeback vehicle ‘Vijay Rath’ for campaigning in the Delhi assembly polls November 29. Amid freezing conditions with incessant snow and rains since this morning, the election fever has been at its peak with the rallies of contesting candidates going on across the valley. The former NC stronghold of Ganderbal sprung several surprises at party president Omar Abdullah today. On the one hand, it threw stones on his cavalcade, forcing the security to resort to tear gas shelling. On the other it greeted him with tears, showers of marigold, and even servings of steaming hot saffron milk.